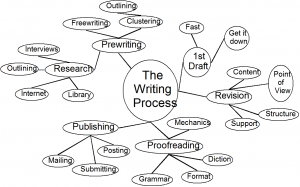 In a recent post, we examined the process of writing. Keep in mind that even though the five steps I outlined can seem like a long and complicated way to write, they are really designed to make writing easier. 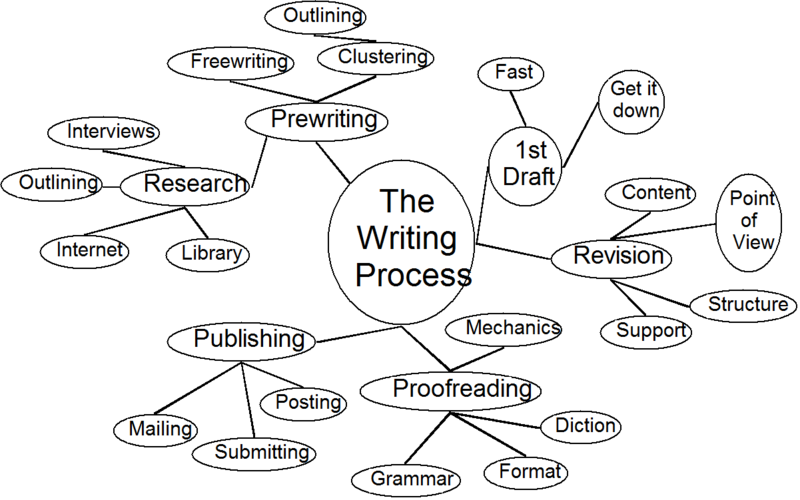 The writing process does this by dividing the work into simple, manageable steps. 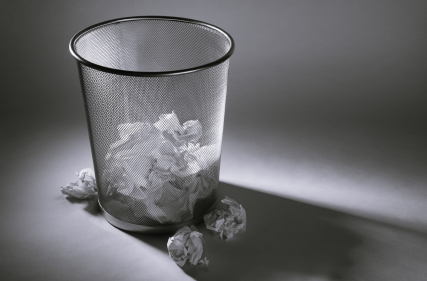 One step that student writers frequently overlook is the first one — prewriting. They launch into composing before taking the time to plan and organize their thoughts. This kind of impatience often turns out to be costly. Papers written without wise preparation are not only poorer in quality, but frequently more time-consuming than papers written with attention to the prewriting phase. That’s right — skipping this step can actually cost you time. We think the best strategy is to combine freewriting or clustering with outlining. Use one of the first two “brainstorming” strategies and then fashion an outline to corral your scattered ideas. Below is the cluster example above converted into a simple outline. Before this outline would be helpful to the writing process, however, the writer should fill in some detail and perhaps eliminate some of the less significant points. Water – it’s the modern wine. At Claridge’s, a water menu featuring a lot more than 30 worldwide varieties is set to make a splash if this launches this month. Keep it simple having a 拢5 bottle of Tau from Wales, and for 拢20 experience the taste of New Zealand’s finest volcanic springs. Gimmick? Not in any way, says Renaud Gregoire, Claridge’s food and beverage director and my water sommelier. I truly believe within the menu. I thought long and hard over it, and becoming hold of waters from remote places was extremely challenging. It’s taken me 10 months to master. Thank you Brian for explaining the prewriting process. I’m working on a paper for my Research and Writing class and this is the area I want to focus on. I’m going to cite your article in my paper because it was so useful! Great! Thanks for the kind comment. I think that this was an awesome post. I just started college and have to write a huge paper. So this helped me figure out how to get started. Is Bubble Network belong to Bubbling? I am denish , doing MA ENGLISH LIT in India. I have doubt. how to write an abstract? ,In what way setting out the objectives and thesis outline? kindly send me a reply. Great information on your site. I would like permission to use the graphic organizer picture of clustering ideas for a PowerPoint in my Orientation to College class that I am teaching at Oakland Community College in Southfield, MI. It’s a great example for students that may not be familiar with a graphic organizer. I am writing to ask permission to use portions of your article in a lesson designed for adult learners at Emma Dickinson Lifelong Learning Center in Missoula, MT.